I think I was six or maybe seven the first time I got to go to the theater. I remember a lot of details about my first outing to “The Nutcracker”. I went with my cousins, both of whom are close to me in age, and their nanny, who dressed us up and encouraged us to behave for the evening that would be very special. I wish I had a copy of the picture of the three of us, sitting on the top arm of the couch as we anxiously awaited our evening out. I remember what I wore, a floral velvet dress with a lace bib that had a lovely print of Snow White across the front. I remember holding hands with Lauren and Leah in the back of the car, and getting to order a special treat in the lobby. I remember the thrill I had as the sugar plumbs danced across the stage, and the way the music floated through the air and into my heart. And, I remember how I stepped on a Junior Mint, and it melted all over my little Mary Janes and the nanny spent a lot of time scrapping the minty goo off of my shoes until she would let me back in that car so we could go home. For those of you who know me, this spilling, making a mess incident is nothing new – not surprising that while falling in love with theater and the stage I also had a “Spilling Incident.” For a couple of months whenever I encountered the nanny I would glare at her, hoping to communicate my shame and embarrassment at that spill directly into her heart. Not my fault I stepped on the chocolatey mess. Don’t you know that’s just what Katie does? While I may have grown out of that Snow White dress, and am getting better at managing my spilling incidents…… I have not outgrown my love of theater. I have had the immense privilege of a few outings to the Buell Theater, shows on Broadway, and appreciation for the arts and singing and dancing and the wonderful creation of stories acted out on stage. 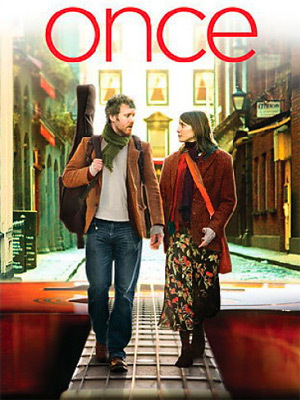 This week I got to go to the performance of “Once” at the Buell Theater. The tickets were my Christmas present, and I had waited five months to see the show. What a wonderful demonstration of talents, acting and beautiful music. For those who aren’t familiar with the story, check out the documentary style film, and listen to the music and take any opportunity you can to acquaint yourself with a story that so many longing people can relate to. I don’t act, and don’t play instruments, and I was blown away by the small cast that not only acted, but performed all the music themselves. This story, too, has a little bit of back story in my life. A few years ago, when my brother was in the midst of turmoil with drugs and alcohol, and our family was on his roller coaster, I had the opportunity to see the band The Swell Season that performs this music. That one night brought life to my aching heart, and I could connect with the music in a way that was just what I needed for that time in my life. That is what is so wonderful about music and about stories isn’t it – it gives us something to connect to? This story will always have a special place in my heart; these musicians too portray every day live with amazing simplicity. Humor, love, desire, passion for life and owning one’s stories. I can get behind all of these things. I’m sure I’m not portraying the beauty well myself here, and so I turn, instead, to my heart, and let the joy bubble and simmer within itself in appreciation for what this story does for me. Check out the music, tap into the story, and see what “Once” can bring to you. Below is the funniest clip of the music done by The Swell Season below. I love it… and hope you will too. ← This too shall pass.